The Clean Booth is a cost efficient alternative to a clean room. Cleanliness class 1 is achievable with this versatile equipment that is expandable, portable and durable. The aluminium framework offers a stable structure yet requires minimal construction time. The adjustable support allows for easy height adjustment. 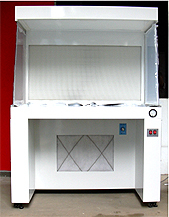 The side panels can be constructed out of acrylic, DC plate or anti-static vinyl sheet as per customer's requirements. The High Efficiency Particulate Air (HEPA) filter ensures an efficiency of filtering 99.97% of 0.3μm or larger particles. The resulting laminar flow also restricts any contaminating particles present to the streamlines thus ensuring minimum contamination. For more stringent requirement, Ultra Low Penetration Air (ULPA) filter achieves a rate of 99.9999% of 0.12μm or larger particles. The Air Shower is able to remove surface lint, dust and other contaminants from personnel entering the air shower. It is a self-contained unit that recycles the air through a HEPA filter. High velocity airflow of approximately 22 m/s is used to remove the particles. A programmable logic control (PLC) allows for a cycle time of 0-60secs for the operation of the air shower. Electro Mechanical (EM) lock prevents accidental cross contamination due to premature or accidental opening of doors. The size and design of the air shower can be customer made to include auto doors, left turns, air tunnels as well as 3 way entry / exit systems. The Fan Filter Unit (FFU) allows for the air to be directed into the clean area through a High Efficiency Particulate Air (HEPA) It functions as an inlet for all clean air into the clean room or clean area. The air is forced through the filters by a centrifugal fan unit. The resulting airflow is laminar and clean. 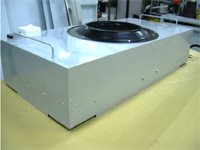 The fan unit is a high efficiency forward curved impeller and powered by a ROSENBERG external motor EKAD355-4. The Pass Box is designed such that an interlocking system prevents cross contamination. Utilising either a mechanical or electrical interlocking system, particles are not allowed to flow freely into the clean room. Special nozzles can be installed to provide a cleaning effect on the items placed in the pass box. A pre-set timer allows for the duration of blowing to be controlled. 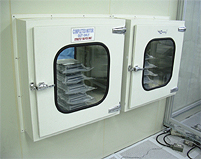 The Laminar Flow Bench is a self-contained system that provides an economical contamination controlled environment. Designed to sit on top of an existing tabletop or as a stand-alone unit, it offers a class 100 or better environment using HEPA filters to remove up to 99.97% of 0.3μm or larger particles. The continuous flow of clean air ensures that the work area is constantly purged of any contaminants present. The vertical laminar flow is selected when the equipment is tall and narrow or when process and personnel are to be protected from powders, chemicals or solvents. The horizontal laminar flow is chosen when the product or process must be the first in line with the clean air or when workers lean over work surfaces when carrying out the process. Pro-Pack's comprehensive line of cleanroom furniture is made of stainless steel to meet with strict quality standards. Designed for electronic assembly, semi-conductors manufacturing, computers industries, etc. Furniture include tables, chairs, stools, sitting bench, work bench, changing room lockers, etc. They meet industry specifications for quality production and ergonomic designs. Dissipative table tops are also available.